Financial institutions need solutions that produce results - that add to the bottom line and help them grow. Banking CPAs members firms have the knowledge and skills to help capitalize on opportunities and guide them when complex issues arise. Banking CPAs members serve over 2,300 community banks across the country, including SEC registered banks, holding companies, credit unions, consumer finance companies, de novo banks and mortgage banking companies. 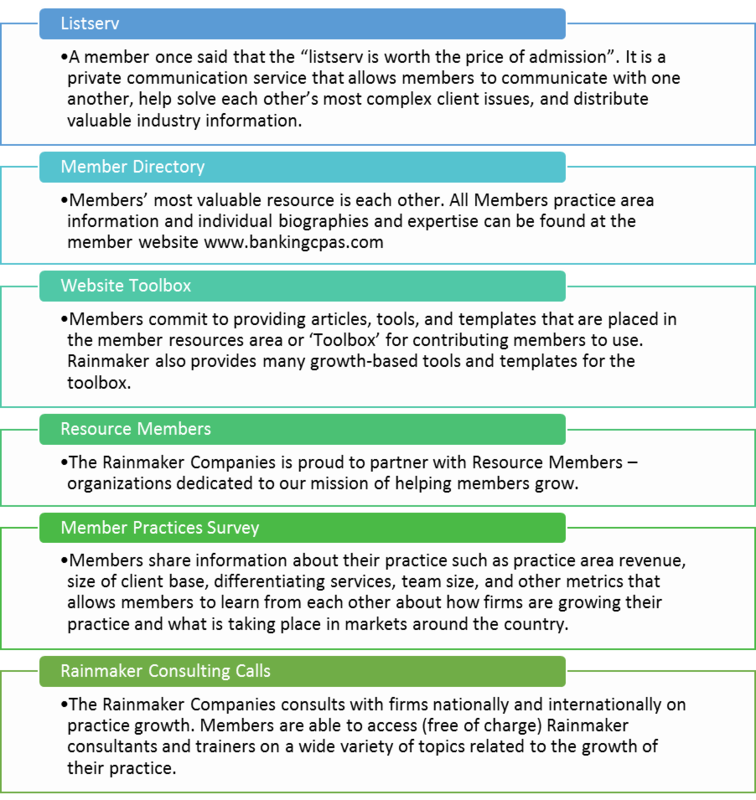 Members understand the economics, operations, and trends in the industry. Members attend training on serving financial institutions to stay on top of the latest trends and issues facing financial institutions today. Trying to maintain stability in today's challenging environment is not easy, not to mention trying to get ahead. You need a CPA firm who understands the specific challenges and opportunities you face and can help you implement proven strategies to improve your operations and profitability. Banking CPAs members are focused on addressing the strategic, financial and operational issues that are critical to improving the performance of their clients. Their devotion to the community banking industry is apparent by their membership in the Banking CPAs. Members understand your banking customer expectations, the regulatory demands, FDICIA and SEC complexities you are faced with and are able to provide the sound advice you need to maintain compliance. Banking CPAs member firms demonstrate their commitment to the community banking industry through involvement with state and federal regulatory bodies. Members also maintain high visibility in their local and state banking associations and frequently participate in legislative receptions and leadership counsel meetings. Many firms sponsor events and host seminars designed to update their clients on current issues affecting the banking industry. There is a synergy among the membership of the Banking CPAs, members share industry expertise and work together to solve their clients' changing needs. The loyalty and longevity of the membership is showcased by the fact more than 50% of Banking CPAs firms have been members for more than 10 years, and several others for more than five years. When you choose a Banking CPAs member, you are choosing an entire network of firms that demonstrate experience and proficiency in key areas of banking. Members enjoy a reputation for high-quality work and are eager to demonstrate why they are known as the best in the industry. Banking CPAs members are ready to work with you to help you meet all your key challenges. Each member firm is able to provide a range of services beyond the standard level of service. Whether you need a loan review, internal audit, compliance review, consulting on a merger or even a start-up, the Banking CPAs has a firm qualified to serve your industry needs. In addition to traditional auditing and tax assistance to financial institutions, Banking CPAs members can help you prepare for Federal regulators. Regulators appreciate a candid review of issues ahead of time, and tend to look favorably upon proactive steps being taken to improve. Banking CPAs members can help you prepare for state and federal examinations by finding those situations and issues that need attention before the regulators arrive.